Ministry of Culture under Government of India and Indian Space Research Organization (ISRO) has announced one of the biggest exercises to preserve and monitor all heritage sites and monuments of national importance. Using data from satellites, ISRO will now map and create 3D images of all such heritage sites in the country, and allow everyone to have a virtual tour of the locations. As per the details coming in, this massive project will have three major objectives: Conversing, Preserving & Monitoring of all archeological sites in India, which are deemed important. Using this data, Archeological Survey of India (ASI) can ensure upkeep of these sites with minimum effort and resources. ISRO will analyze the data coming in from satellites such as Cartosat-1, Cartosat-2 and Resourcesat LISS IV; and map and recognize all heritage and archeological sites in the country. Using high resolution satellite data, a Geo-spatial database of all world heritage sites and important monuments will be created. A standard operating procedure (SOP) would be created, wherein the data is directly passed over the ASI and other organizations which are active in preservation of these assets. Infact, ISRO has also planned an open source, scalable and modular model, which can be flexible and open to changes. 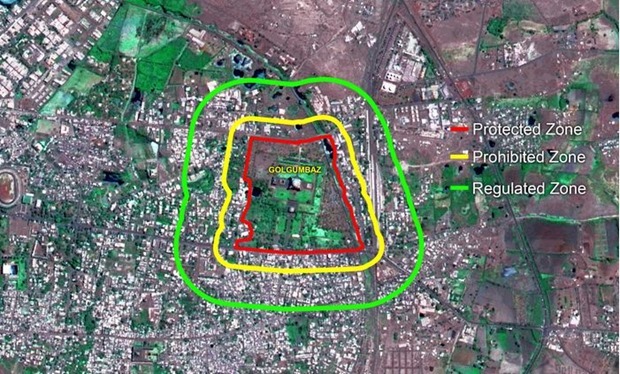 After locating the heritage site, the data would be segregated using three management zones: Protected, Prohibited and Regular, which will assist the concerned authorities to make quick and fast decisions. ISRO also plans to make this movement a crowd sourced one, as an application would be developed which would allow citizens and tourists to upload pictures from various angles, which would be directly merged with the main 3D mapping. ISRO has already started the process of mapping heritage monuments in Karnataka, and the visualization has reached an advanced stage now. Some famous monuments like monuments in Belur and Halebidu, Shravanabelagola, Gol Gumbaz in Bijapur, the pre-historic site of Chandravalli, fort and temples in Chitradurga, the fort and masonry elephants in Madikeri, and Tipu Sultan’s birth place in Devanahalli and more have already been mapped, and ready for public viewing. 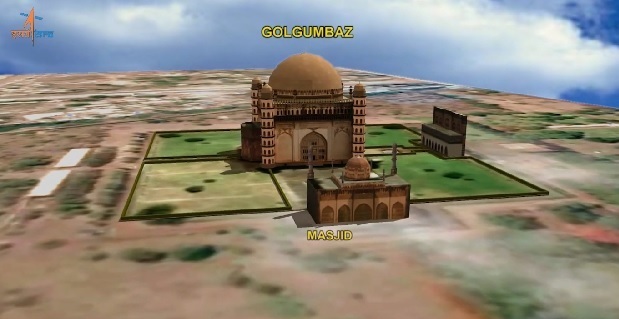 Here is a 3D model of Gol Gumbaz, one of the largest dome structure in the world. Using Google’s Streetview feature, ASI has already partnered with Google to showcase all major heritage sites at one place. Infact, Taj Mahal is the most popular destination within the Google Street View database. However, this partnership only covers 31 odd monuments. But with ISRO’s project, even distant, remote and inaccessible heritage sites and monuments can now be mapped and preserved for ever. Here is more information about the project, directly from ISRO’s website.